This statistic contains data on the average amount of time people in different countries spend watching TV. In 2016, Americans watched 270 minutes of TV per day, while people from Sweden only watched 148 minutes per day. Of the time that Americans spent watching television in 2016, 240 minutes was spent watching live TV and a further 30 minutes was spent watching time-shifted TV. The country-wide average for daily television viewing in 2016 stood at 219 minutes. As of 2015, an estimated 1.57 billion households around the world owned at least one TV set , while the surge of the internet has further extended the penetration rates and daily consumption of video content around the world. 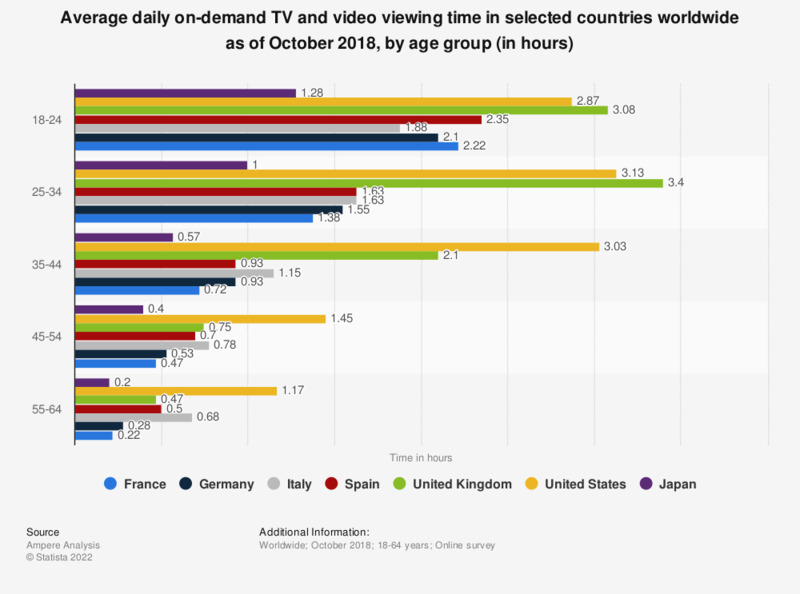 According to a 2015 report on average daily TV viewing in countries around the world, users in the United States lead the world in daily TV watching time, with some 274 minutes, the equivalent of more than four and a half hours. Another report shows that Americans predominantly spend their time watching cable television, with an average of 205.8 minutes of cable TV content forecast to be watched in 2018. However, as an increasing number of people turn to the internet and streaming services for their television fix, the number of U.S. households without a television is on the rise. In 2011, there were 8 million "cord nil" households that made no use of cable, satellite or telco services, a figure which rose to 22 million by 2016, the equivalent of 22 percent of all broadband households. The future of pay TV also appears to be under threat as a result of the direct competition from streaming services such as Hulu and Netflix. The number of pay TV subscribers in the United States has decreased from over 100 million in 2010 to 95.7 million in 2016, with numbers expected to continue falling to 90.7 million by 2022. In comparison, the number of subscribers who subscribe to three or more streaming services has more than doubled from nine percent in December 2014 to 19 percent in December 2016. The data includes time spend on watching TV live and time-shifted viewing. *data only includes live broadcast TV viewing. How often do you use your television?